The Japan Ryugaku Awards selected recommended universities and vocational schools for international students by the vote from staff of 181 Japanese Language schools in Japan and the seventh award ceremony was held this year. 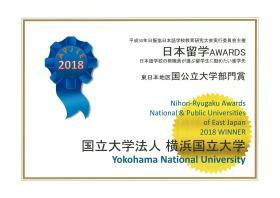 YNU won the grand prize for the first time in the category of National and Public Universities of East Japan in 2017. This year, we received the grand prize in the category of National and Public Universities of East Japan for two consecutive years and the grand prize in the category of Graduate schools of East Japan for the first time. It was a great honor for us to be awarded. 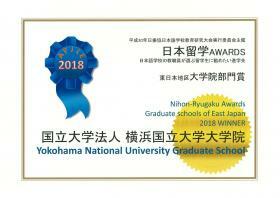 Last year, YNU won the prize in the category of Graduate schools of East Japan for the first time and then won the grand prize this year. Consequently, we received grand prize in two categories including the category of National and Public Universities of East Japan. We believe that our active efforts to accept international students were evaluated by these prizes and it was very delightful to us. Through these honorable awards, we would like to provide further support for international students in the future. ＊These awards article were published in a newspaper “The Japan Times” dated October 15th, 2018.